Cleve Moler is the author of the first MATLAB, one of the founders of MathWorks, and is currently Chief Mathematician at the company. He is the author of two books about MATLAB that are available online. He writes here about MATLAB, scientific computing and interesting mathematics. The first computer that I seriously used was the Burroughs 205 Datatron. I actually used two different machines, one at Caltech for two years in 1959-61 and one at the University of Utah in the summer of 1960. Both the technology and the style of usage were wildly different from today's computers. The blinking lights on the console made the B205 a featured player in many movies and TV shows during the late '50s and early '60s, including Batman and Lost in Space. Here is an animated gif on a reproduction of the console. Wikipedia tells us that the American Arithmometer Company was founded in 1886 to manufacture and sell adding machines. The company name was changed to Burroughs Adding Machine in 1904 to honor the founder, William Seward Burroughs, who, coincidentally, was the grandfather of beat generation poet William S. Burroughs. At one time it was the largest adding machine in the country. The company was merged with Sperry Corporation to form Unisys in 1986. In 1956 Burroughs got into the new computer business by acquiring Electro Data and began marketing their Datatron, which had been introduced two years earlier. Throughout the '50s, '60s, and '70s, Burroughs was a force in computing, particularly in the academic and banking markets. In the 1960's, IBM completely dominated the industry, but there were enough smaller companies that all together they were known as "IBM and the Seven Dwarfs." In 1959 the Burroughs 205 Datatron cost a few hundred thousand dollars and occupied an entire room. (Here is a 1957 price list). In the foreground of this photo are the console and an electric typewriter. 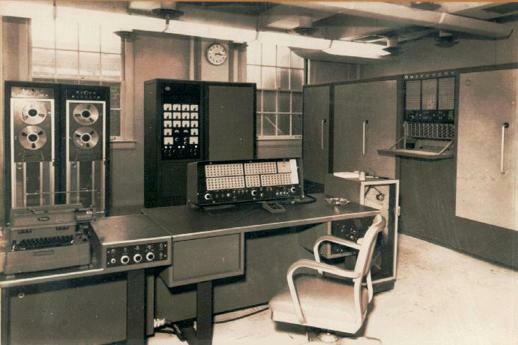 In the background are a magnetic tape drive and several cabinets containing a total of about 1600 vacuum tubes. I like to joke that this was a "personal computer". Only one person could use it at a time. We would sign up for machine time, usually in half-hour chunks, at all hours of the day or night. This was before transistors and semiconductors. The primary logic unit was the electronic vacuum tube. Here is one plugin module with eight tubes. The computer worked in base 10 and this module held one decimal digit. Four of the tubes held one digit using the binary combinations 0 through 9. The binary values 10 through 15 were never used; if they showed up, it was an error condition and caused an immediate halt. 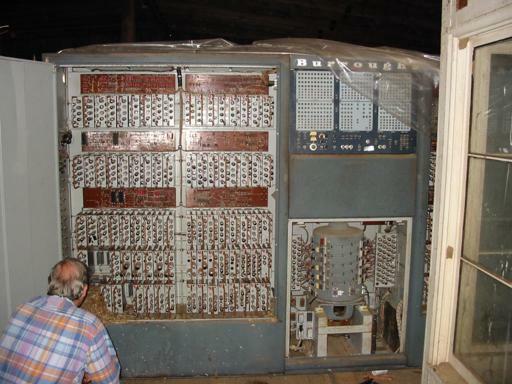 Before the magnetic core, a huge problem with early computers was memory. People knew how to produce the electronics for the arithmetic, logic and control units, but where do you store programs and data? The 205 had drum memory. Think of the rotating drum in a small clothes dryer. Here is a photo of a machine that has not been used for years and that has not been stored carefully. The drum is at the lower right. Four registers, each containing ten of the single decimal digit modules, are at the upper left. The drum held 4000 ten-digit words. If you regard each digit as half a byte on a modern binary machine, that is 20K bytes. The words were stored in 20 bands of 200 words each. The drum's speed was 3570 rpm. So, on average, it would take about 1/30-th of a second to access the start of a band. In addition to the primary drum storage, there were four "high speed" bands where a block of 20 words is duplicated ten times around the drum. This was sort of like cache memory on today's computers. One machine instruction would duplicate 20 words, usually a piece of a program, ten times around a high speed band where it could be accessed ten times as fast. I learned a little about the 205 during my sophomore year at Caltech in the spring of 1959, and more when I was a junior and took numerical analysis from Prof. John Todd in 1959-60. We used Caltech's 205 for some of the homework in that the class. Then I went back home to Salt Lake City for the summer of 1960. It turned out the University of Utah also had a 205 and they were happy to hire me for a summer job. There were just four people working in Utah's computer center at the beginning of that summer -- a woman who served as director, me, and two part timers, a secretary and a grad student from EE who maintained the machine. Then, a few weeks into the summer, the director resigned. So I found myself -- two months before I turned 20 -- Acting Director of the University of Utah Computer Center. I returned to Caltech in the fall, and had a chance to do individual study under Todd and more work on that 205 until I graduated in 1961. I did a project involving Hilbert matrices. It was my introduction to matrix computation. At first, at both Caltech and Utah, we did not have a compiler or an assembler. 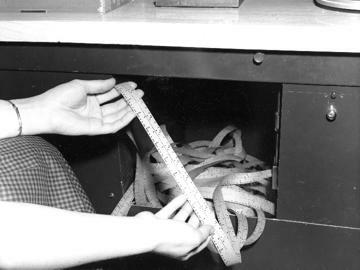 We wrote our programs in absolute numeric machine language and punched them on paper tape, like this. The machine was designed so that op code 00 meant "read one word from paper tape into the current location and go to the next location". There was a button on the console that would erase the drum, set the location counter to 0000 and the op code to 00, and then start the tape reader. That served as the "operating system". It would read the entire contents of the paper tape onto the drum. When the tape ran off the end, you would turn off the reader, set the location counter back to 0000, and press start. That would begin executing the program you had just read from tape onto the drum. There were five registers. The A register -- the accumulator -- is where arithmetic happens. It holds ten decimal digits, plus a sign bit. For example, one instruction is "Add the contents of memory location XXXX to the A register". The R register -- the remainder -- is an extension of the A register. Multiplication of two ten digit (fixed point) numbers produces a twenty digit result across A and R. Division produces a quotient in A and a remainder in R.
The C register -- the command register -- holds the instructions as they are being executed. The D register holds a single word as it is being transferred to or from the drum or external I/O equipment. The B register -- the index register -- is only four digits wide. If the sign bit of an instruction is a 1, the contents of the B register is added to the address portion of the instruction, thereby providing an array index. The value of the B register is automatically increased or decreased by one after each indexing instruction. A floating point arithmetic option was available for an additional \$12,500. (Floating point was also an option with the Intel chips used in the first PC's. The 8087 chip cost about \$150.) The floating point word has a two-digit exponent and an eight-digit fraction. So floating point numbers range from about 10^(-50) to 10^50 and have an accuracy of about 10^(-8). 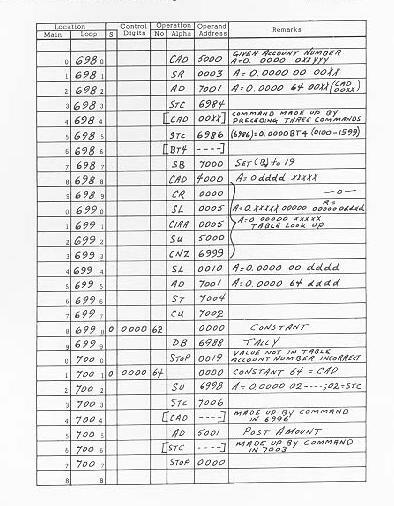 Here is an example program from the appendix of the machine manual. This writeup is much fancier than the programs we would actually write. It's on a coding sheet; we would just use lined yellow notebooks. We would never need to write out 6980, 6981, etc. And the Remarks are much more detailed. This example is intended to be carefully explanatory. One of the programs that I wrote during the summer at the University of Utah involved a loop that was exactly 20 instructions long. That meant the entire loop could be loaded into the high speed memory. It didn't even need the jump instruction from the end of the loop back to the beginning. It would just continue execution from the duplicate of the code in the next block on the drum. The trouble was there was no way to exit the loop. I needed a "Skip on Minus" instruction. There was a "Skip on Plus", but no "Skip on Minus". The EE grad student who maintained the machine was a guy named Joe. I wish I could remember his last name. Anyway, I told him I needed a "Skip on Minus" instruction. He said, "I'll put one in". He disappeared behind the cabinets with circuit diagrams and a soldering iron. He called out, "the op code will be 51". I wrote my program with a "51" instruction. It worked perfectly. And so the University of Utah had the only Burroughs 205 Datatron in the world with a "Skip on Minus" instruction. Thanks for your recollections and this very interesting post. My colleague TJ Sawyer and I have been working on an emulator for the 205 over the past few years, and on reconstruction of Donald Knuth's Algol-58 compiler for that machine. Both have been working for almost two years now, although we don't have the complete run-time libraries for the compiler. We have also reconstructed the Shell Assembler and have it working. The emulator runs in a standard web-browser (Firefox and Chrome are best for this), and anyone is welcome to use it. See http://www.phkimpel.us/ElectroData-205/. There is a link on that page to the wiki with instructions on setting up and configuring the emulator, as well as a link to the project repository. The code is open source. Tom has done extensive research into the early history of Burroughs, ElectroData, and the origins of the 205, which trace back (along different paths) to Herbert Hoover, Jr., Clifford Berry, and the Pilot Ace. He has a web site devoted to this research, http://www.tjsawyer.com/B205Home.htm. Tom and I also maintain a blog devoted to the project, http://datatron.blogspot.com/. If you need a Skip on Minus instruction, I'll put one in. Op code 51 is still unassigned.